1) Mention why are you interested in this Internship? · Show them that you are interested and ready to invest your time into such an opportunity. · Explain about your expectations and goals. · Be specific why you chose particular company when applying. 2) As an intern what you would like to ask hiring manager? · Whether they might consider hiring an intern full-time or part-time. 3) Mention how you could impress your supervisor or present your pro-activeness during the internship? · And learn to set your own internal goals of what you’d like to achieve even if your supervisor doesn’t. 4) Mention how you could add value to your company as an Intern? 5) Mention what you should expect during Internship? · As an intern, you might involve doing regular and less responsible work like data entry, filing, or scheduling appointments for your boss, checking emails, etc. · Expect to be proactive. Initially, ask your direct supervisor for work. Don’t go over too many heads to get an assignment. · Your internship should reimburse you somehow-whether by a paycheck, class credit, stipend, housing subsidies or other perks. In exchange for your work, a company should give you more than just its name on your resume. · Ask questions to your role model and find out how they reach there. Also, find out who they know in the industry. 6) Mention what are the Do’s and Don’ts for an intern? · Don’t give up easily on your internship quest. · Make sure you have regular meetings with your internship supervisor. · Make sure during internship you learn new skills, a better understanding of your field, and tangible accomplishments. · Send a thank you letters at the end of the internship to all people who interview you and helped you finish your internship. · Don’t burn bridges even if your internship was not the best. 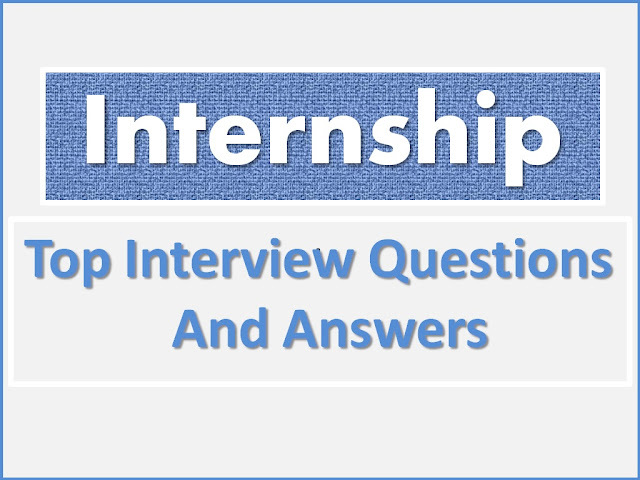 7) Explain how can you make most of your Internship? 5. Note down key learning during internship like What technical and computer skills are you using? What tangible results have you achieved? What types of analysis are you doing? 8) Mention what are the challenges faced by an intern? 9) What you must do after the internship is over? · After internship talk to your supervisor about work opportunities. Asking for more work shows that you can assume the responsibilities of a full-time employee. · Follow-up with your previous employer with periodic updates on what you are studying and your interests, as well as by providing information that is of interest to them. · Find your mentor in the field of your interest. · Start looking actively for things you want to do. 10) Mention what you must cover in your internship report? In your internship report, you must cover following details. · Give details about the division or department you worked in. · Provide details about what you did on the job. Explain your duties/chores in detail. · Take a long, hard look at your experience and mention the good and the bad of it. · Show a variety of pieces like ads, Layouts, reports, tapes, editorials, brochures, letters, and scripts. 11) Mention how to get a job offer while you’re still an Intern? · Spend time with the companies you researched and express your desire to find an exciting full-time position.